FBI Agent Lucy Kincaid is only two weeks away from her wedding to Sean Rogan when Sean’s twin siblings, Liam and Eden, hit town, and they are intent on much more than congratulating the bride and groom. The unscrupulous pair make a snap decision to commit an unforgiveable crime—a crime that places Lucy directly in the sights of a brutal Mexican drug cartel that would love nothing more than to make her pay for terminating their human trafficking business and taking down their leader. This 12th book in New York Times Bestseller Allison Brennan’s Lucy Kincaid Series rocks the reader through a tale of obsession and revenge as the Kincaid and Rogan families combine forces to shut down their enemies and even their own family members that conspire to MAKE THEM PAY. MAKE THEM PAY is a well-crafted balance of mystery, suspense, and romance that keeps the reader turning the pages. Each character is deeply-drawn with a purpose, a mission, and a history that link them solidly to the plot and keep it moving it forward in unexpected ways. Loves are lost. Loves are found. Obsession and revenge take their toll on families and relationships while new bonds take root. All of this makes for a complex plot, intricate sub-plots, and complicated characters. For some writers, this would prove too much, but Brennan has a gift for weaving the complex with just the right touch to deliver a story that is both compelling and satisfying. I thoroughly enjoyed MAKE THEM PAY and look forward to reading the rest of the Lucy Kincaid Series. 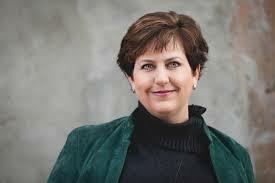 Allison Brennan is the New York Times and USA Today bestselling author of 30 thrillers. 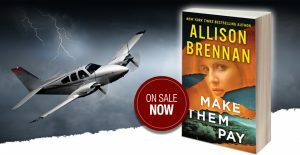 You can find MAKE THEM PAY and her other bestselling novels at her website, Allison Brennan: New York Times Bestseller. Sounds good, I’ll have to check it out. There are so many good books out there. It would be nice if I could just do nothing but read all day, but unfortunately I don’t have that option. LOL.